Today is a travel day. 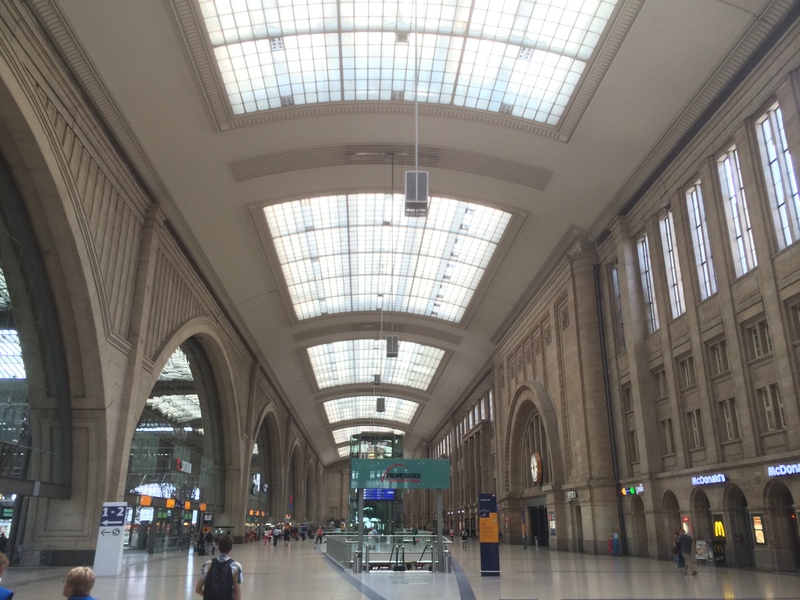 I’m headed from Leipzig to Karlovy Vary, CZ. 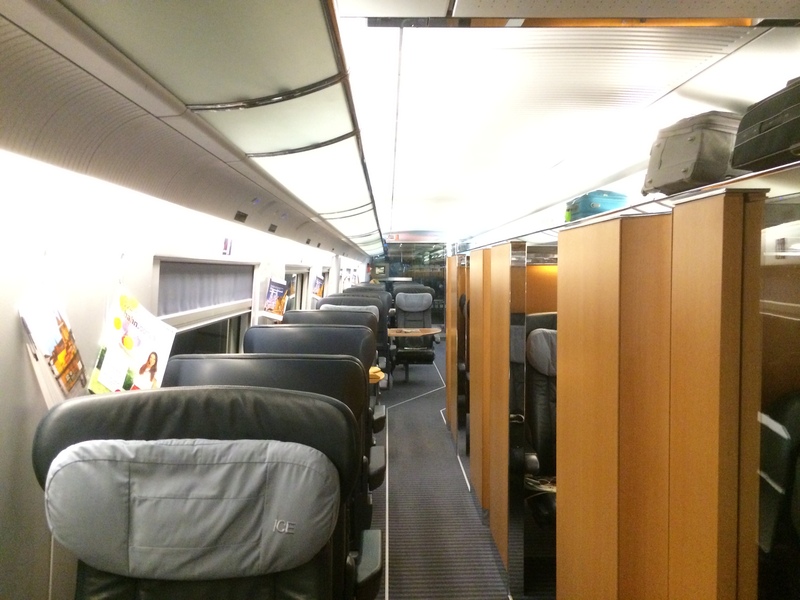 It’s now precisely noon, and I’m seated in a first-class cabin on a Deutsche Bahn Inter-City Express (ICE) train en route to the Dresden Hauptbahnhof (“main train station”), where I’ll have a five minute transition time to get on board a mere IC train for service into the Czech Republic. From there, the train will cross the border at the German exit point that is the town of Schöna and I will switch trains again – this time with a forty-minute window – at Ústí nad Labem. I am due to arrive in Karlovy Vary at 4:46pm this afternoon. I wish the whole ride were on this ICE train, though. What a train! A smooth ride, comfortable faux-leather chairs lined in a row of single seats along my side of the car, a big window to my left and a useful and wide (for transit) table in front of me. 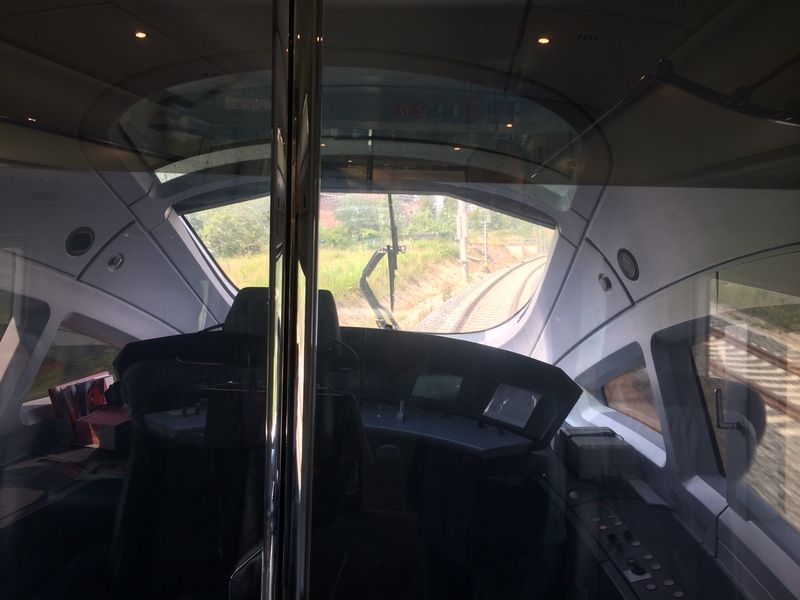 The doors between cabins are glass and are automated – when one walks up to any one of them, it opens with a pffft of air and slides open, seemingly without friction, to reveal the world of the next car. I walk to the rear of the train and snapped a photo of what would be the seat of the train’s conductor (or is it pilot, at these speeds?). The window in front of the captain’s chair is slanted outward at a severe angle, matching that of the exterior of the train, and there’s an intricate control panel in front of where he or she would sit. Fantastic. We pass by small towns that somehow aren’t important enough to warrant a train station. There’s usually a church in the center of the town, and the little German houses nearby are warm and inviting. I feel bad that I not only don’t know the names of these towns and have no practical means of discovering them, but that it’s unlikely I’ll visit them anytime soon, out of the way as they are. I hope someday to make a trip through Germany by car or bicycle so that I can stop by these lovely little hamlets. Here and there, when we do pass a station with some trains stopped at their platforms, those that are stopped are labeled S-Bahn, complete with green circles and silver S marks on their fronts and sides. I suppose the S-Bahn plays a different role here in mid-country – they’re fancier than those older ones serving Berlin, as they’ve got to make longer trips here than there. At Leipzig Hauptbahnhof, I spotted one of these that had a sign painted along its sleek, silver exterior: “S-Bahn Mitteldeutschland” (“middle Germany”). In the Czech Republic, I am immediately intimidated by the completely foreign language and setup of the station. I can’t find my train listed anywhere in the places where destinations usually are listed and only manage to board the correct train because I’ve written down a train number in my notebook, and I’m willing to trust what I’ve written down. Nowhere in the station is my destination (Karlovy Vary) listed on either a destination or a waypoint list. Eegads. Take me back to Germany, where everything is clearer! This entry was posted in Travelogue and tagged Ústí nad Labem, Czech Republic, elbe, germany, language, terror and confusion, trains, travel. Bookmark the permalink.